Jishou is in the northwest of Hunan Province, at the eastern foot of Wuling Mountain. It is the capital of the Xiangxi Tujia and Miao Nationalities Autonomous Prefecture. 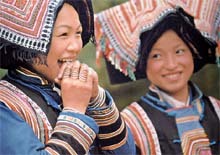 The tourism facilities and area strongly features the customs of the Miao ethnic group. Located in Yongshun County, it is about 90 km west from Zhangjiajie Tranquil, with deep water and karst land forms, the tourism area covers 4,000 hectares. A 2,000 year old village at the juncture ofthe Mengdong and Yuanshui rivers. It was a capital of minority headmen in the past. Tourists will find a 2.5-km-long street paved with stone slabs, an ancient wall built with stone slabs and exotic buildings in which the Tujia ethnic group lives. It is about 15 km west of Jishou and is surrounded by precipitous mountains. The north side rises vertically to a height of 440 meters, witha70 to 90 degree gradient. It is the most dangerous section of the Hunan-Sichuan highway. 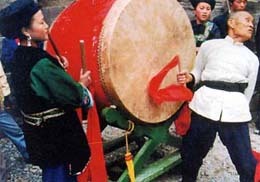 It is about 24 km from the western suburb of Jishou and is home to the Miao minority. Close to it are 12 imposing waterfalls that have a drop of over 190 meters. It has Ming and Qing style architecture and is about 53 km south of Jishou The intersecting stone-paved streets are unsophisticated but elegant. Along Tuojiang River are mostly houses with flying eaves. More than 100 ancient buildings including the Wenchang Pavilion, the Tianwang Temple, the Qifeng Temple, the Dacheng Hall and the Chaoyang Palace can be found in the town.